The past two weeks have trudged along slowly and agonizingly. I didn't realize how much work I had until it came down to actually doing it all and handing it in. This past week alone, I had two essays, two assignments, a test, and a drama performance. Sleep and food were two glorious things that I could only dream of and work towards. When life gets busy, stressful, and crazy, it's hard to see a purpose behind it. It's hard to tell yourself that yes, indeed, memorizing all these lines for a drama class will enable you to get a job and live well in the future. It's hard to make a connection between the monotonous onslaught of work you get in school and the idealistic vision of yourself working in a job you love and are paid for. Hard, but not impossible. After my crazy stressful week, I decided there was no better way to relax than by attending a lecture (ha!). This wasn't any kind of lecture, though... it was Nick Mount's lecture on Sylvia Plath for ENG140. Mount is an infamous professor at UofT - students worship him, girls crush on him, guys want to be him. He makes people love English. 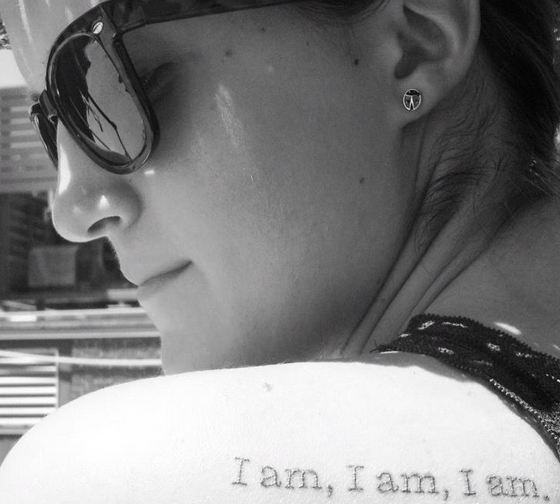 It was in his class, three years ago, that I fell in love with Plath and started a lifetime commitment with her poetry and prose (by commitment, I mean I got a tattoo of one of her quotes... see below). All art offers something unique and different, but literature is particularly special because unlike a sculpture or a painting, it depicts time. Use this to your advantage as a writer. Don't focus on a single moment, focus on the before and after. Show the story. Make use of all the tenses you have at your disposal. Poetry has so many powers. One of them is that it makes the reader pause time and focus on one specific thing: whether that's a balloon popping, a moment of sadness, or reunited love. Writers have the power to get people to pay attention to something. Choose a "something" that is beautiful, important, and has meaning. Show readers things that are in front of them all the time, but they don't truly see. Poetry is a healing device. If you're sad, angry, confused, frustrated, etc, etc, there is no better medium to pour your pain into than a poem. After all, "Nobody would be making poetry if they could be making love." How, you ask, did a two hour lecture on poetry successfully de-stress me? Maybe it was Mount's soothing voice, the beautiful poetry of Plath herself, or the lesson of art actually meaning something and doing something. As a 4th-year English student constantly weighed down by literary theory and hundred-page novels, it was nice to be reminded that words aren't pointless, but a powerful tool to change the world.